Whew – it’s a PACKED week on the blog here! In addition to Sew in Tune, there’s a Boatneck Sewalong going on in my pattern group. We’re getting to the pattern hack portion of the sewalong, so I wanted to make sure and post this hack on how to make a button back top. I’ve been eyeing button back shirts for a while, and I had this Cotton and Steel Spark Coral Double Gauze. I decided I wanted 3/4 sleeves, because I don’t have a Shoreline with sleeves that length. Plus, around here we’ll be in spring weather soon (be jealous). This is a really easy hack to the pattern. First, when cutting out the pattern, I added 1 1/2″ to the center back. This works for me since I was using selvedge edges (I wanted to keep them) and would also work for knits. For a woven that you need to finish the edges of, add 2″ to the center back. Remember to do the same for the back facing. Then cut 2 pieces instead of one piece on the fold. Next, cut 2 1″ wide strips of interfacing that are the same length as the shirt center back. On knits fuse this along the edge of the back pieces on the wrong side. On wovens, first press the raw edge 1/2″ to the wrong side, then fuse the interfacing along the crease line. 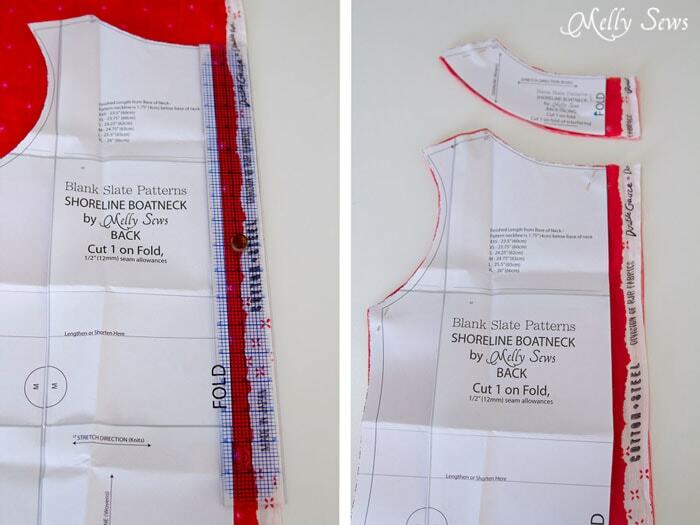 Continue to sew the boatneck according to pattern instructions. When you get to sewing the facings on, sew them in one long line across the neckline of the shirt. 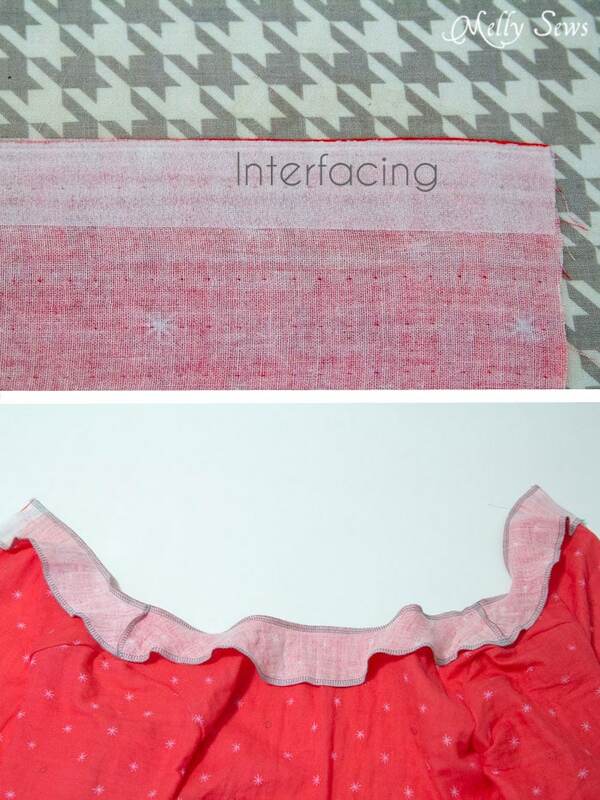 After sewing on the facings, turn the center back edge 1″ to the wrong side and press. If you pressed your woven edge 1/2″ earlier, make sure this is pressed before turning 1″ – so you still have a 1″ wide placket area, with your raw edges are inside it. Stitch near the edge of the 1″ fold to form the placket. Mark your buttonholes (I LOVE this tool I got for Christmas – the Simflex Gauge affiliate link) and stitch them (need help with buttonholes? See this post). 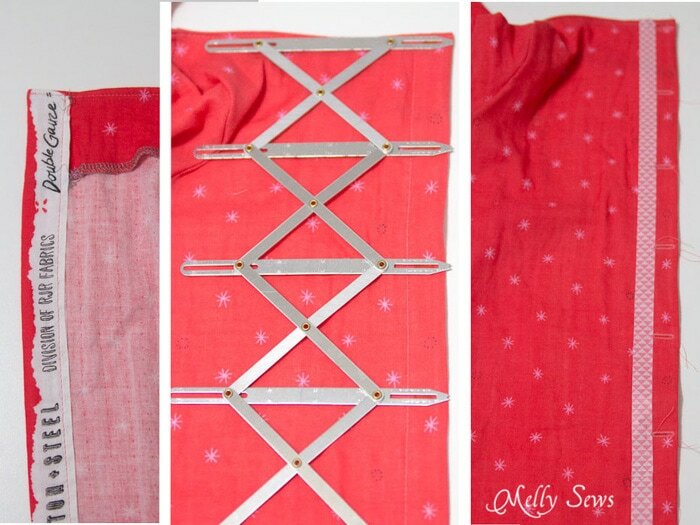 Another trick I use – I put a line of washi tape on my garment to help line up my buttonholes. And then button that baby up and wear!